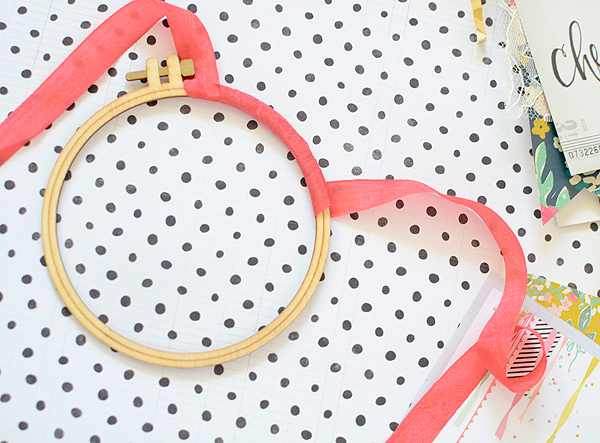 There is a very fun set of wood veneer embroidery hoops that are a part of the Crate Paper Craft Market collection. 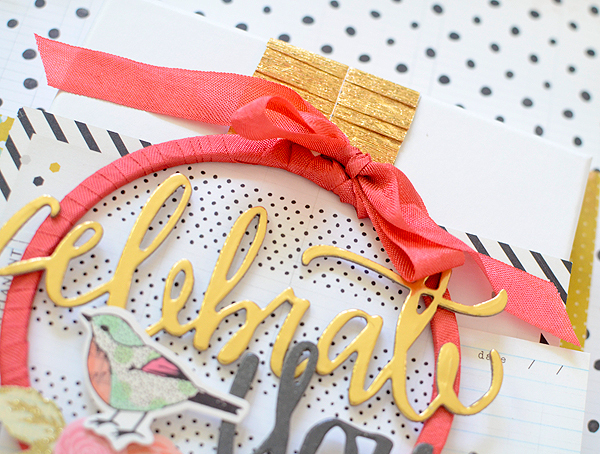 They are especially brilliant for DIY--did you see this gorgeous project from Christine Middlecamp? It's kind of hard to top that one, so I put my own spin on them and created a little something to top off a package. The possibilities are endless in terms of finishing them off--you can paint them, cover them in glitter or patterned paper, adhere buttons or sequins or another small object all the way around them, or you could just leave them as is. For my gift, I decided to wrap them in seam binding. A different trim or fabric will work, too. This could not have been easier. I started at the top, leaving a few inches to tie off at the end, and simply wound it around the hoop until I reached the top again. I used about 1.5 yards to cover the largest hoop in the pack; the ribbon color is Melon, by Hug Snug. Once I reached the top, I wove the ends through the opening of the ring two times and then tied it into a bow. 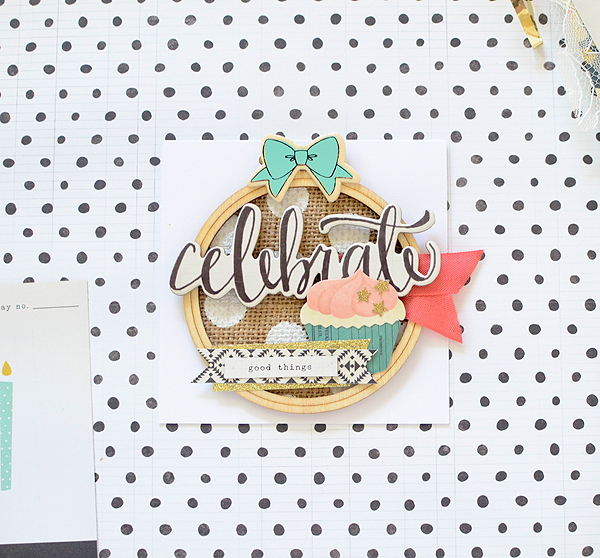 I traced and cut a circle of Confetti's 'Life of the Party' patterned paper which I adhered to the back of my hoop. 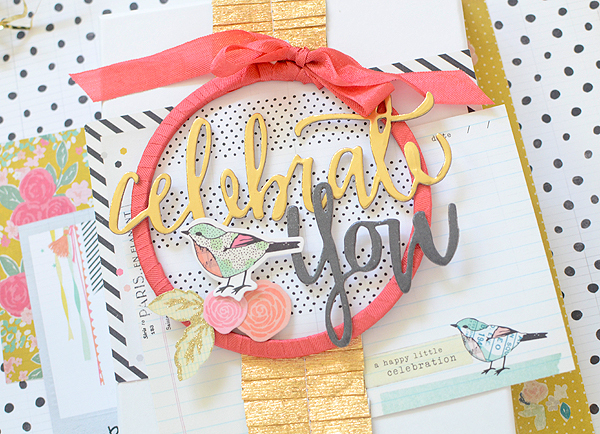 The embellishments I used here were actually my first step in this whole process and the inspiration for the project itself. I was playing around with the large words from Confetti and tried them out on the plain hoop, which I liked all by themselves, but eventually decided to add a few more details. So I had the words and the bird Standout and then tailored the rest of the composition around them. The size of my box is just over 5x7 and I wrapped it in ruffled gold crepe paper (given to me by my lovely friend Bonita Rose; made by the Vintage Scrap Shop). I placed my hoop frame on top of it with a dab of glue to hold it in place. 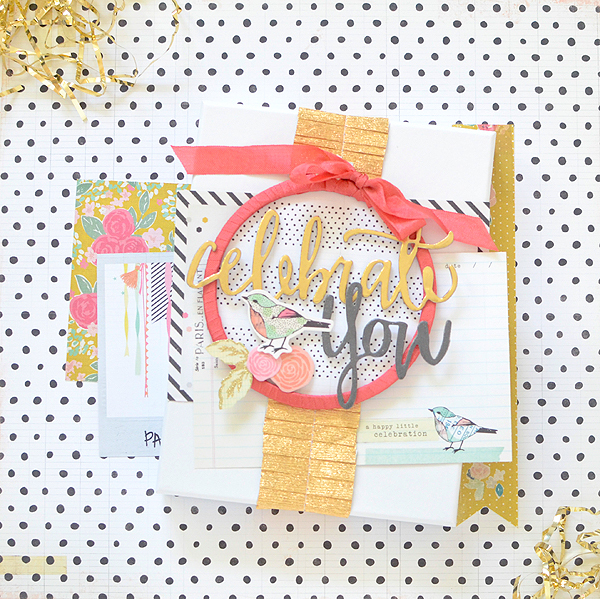 A couple of 4x6 journaling cards tucked behind the crepe paper offer more patterns to dress up the plain white box without having to use wrapping paper (I'm so clumsy when it comes to wrapping paper!!). 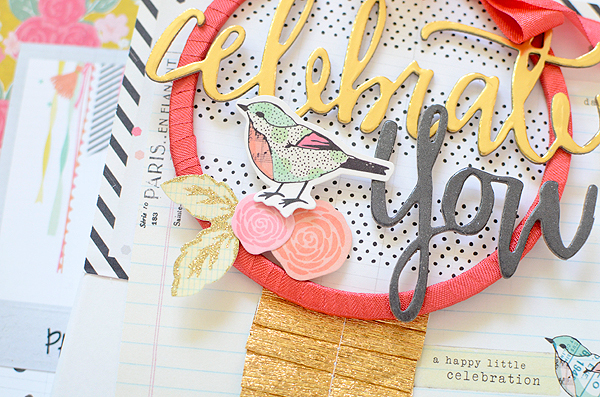 Such a sweet and simple project! I made one more little piece with the mid-size hoop. I left this one plain because I used more embellishments (again, I messed about with it and came up with the decorative elements to start). 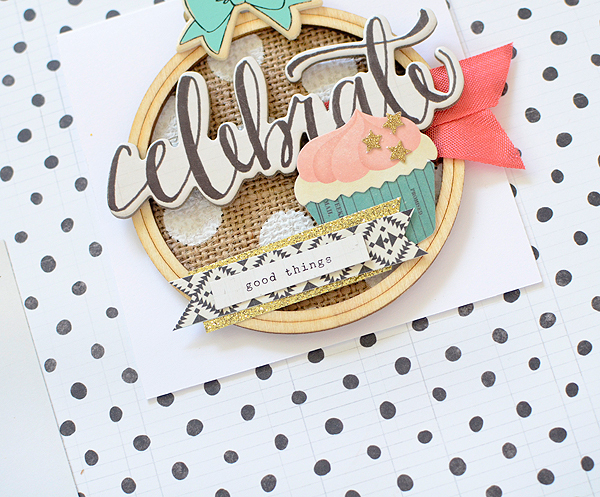 I backed it with the polka dot burlap specialty paper from Craft Market, but everything else is from Confetti. It needed a little something at the top so I added the blue wood bow. It's such a small thing, but it really makes a difference. In the end, I used this hoop on a card instead of a package. It was just the right size for my favorite card measurements--4x4. This size would also make a darling gift tag. What have YOU done with the Craft Market embroidery hoops? Crate Paper and I love to see! Use hashtag #cratehoops and pin or post on Pinterest, Instagram, and Facebook and we'll be sure to check them out! I hope your weekend is off to a fantastic start! your creations are so wonderful! i LOVE the cupcake in the 2nd hoop creation. can you tell me where it is from?